What if the provider is not found? The Angular creates the Injector, when the application root module (named as AppModule) is bootstrapped. This injector is called as root injector and acts as parent to all other injector. The root injector also gets its own copy of Providers. It gets it from the Providers is metadata of @NgModule of AppModule. The Root Component acts a parent to the every component we create. 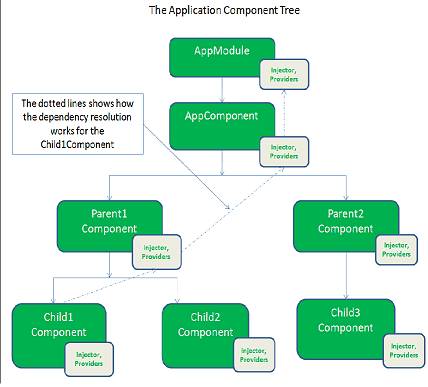 Each of those components can contain child components creating a tree of components. The Injector is created for each of those component creating a tree of injector, which closely resembles the component tree. This is called hierarchical pattern. The injectors also gets their own copy of providers from the @component metadata. The injector is destroyed when the associated component is destroyed. The components ask for the dependencies to be injected in the constructor using the token. The injector passes the request to the injector of the parent component. If the provider is found, the request returns the instance of the Provider. If not found then the request continues until the request reaches the top most injector in the injector chain. The Services are singletons within the scope of an injector. That is, there is at most one instance of a service in a given injector. When the injector gets a request for a particular service for the first time, it creates the new instance of the service. For all the subsequent request, it will return the already created instance. To understand the hierarchical dependency injection system let us build a simple application. The App has a shared service and 5 components. 2 Parent components & 3 Child Components. Create a Shared Service shared.service.ts as shown below. The service just generates a some random number when instantiated. Let us add two parent components, Parent1Component & Parent2Component. Both the components are almost similar. Both reads the SharedValue from SharedService and displays it in the template. The Parent1Component has two child components Child1Component & Child2Component, While Parent2Component has Child3Component. The child components also read from the SharedService and display the SharedValue in the template. We have three child components, which are very much similar. The following image illustrates how the component tree and injector tree of the above app looks like. The Component tree starts with root component (AppComponent in the image). Each component in the component tree gets its own injector. The injector is destroyed when the component is destroyed. The injector is also created for the root module, when the app starts. What happens if the child1Component requests a Service. The injector attached to Child1Component looks for the provider in the Providers collection registered with the Child1Component. If it does not find the provider, it then passes the request to the injector instance of the parent1Component as shown by the dotted arrow in the image above. If the provider is found, the request is returned with the instance of the dependency else the request is passed on the injector of the AppComponent. This process continues until it reaches the top level injector. Where you register the provider for your service, determines the lifetime of the Services. Let us register our SharedService in both the parent components. Add the following code to the @Component metadata. Both the Parent Components will get their own Instance of the SharedService. The Child1Component & Child2Component will share the instance of the Parent1Component, while Child3Component will share the instance from the Parent2Component. The output and the injection graph is as shown below. You can create a Singleton Service by moving the Provider registration to the root injector i.e the root module (AppModule in the example). We learned how the Angular’s hierarchical dependency injection system works with an example code. You can download the source code from the Github. (folder “DI Injector Tree”). You can play around it to get a better feel of it.